Without a pair of a suit, a men’s wardrobe is almost incomplete. This Ultra Suit lets men get more out of their finest outfits which is undoubtedly perfect for all occasions. This is an eco-friendly suit which is both environmentally friendly and impressively versatile thus making it a great pick for men who do not want to compromise with their style. Suits are often considered to be the most expensive items thus many of them can’t afford to own more than one pair. This is where this affordable eco-friendly clothing comes into play that meets all the requirement of men’s in only one suit. The Hi-Tech Eco-friendly Suit is one of the most simple and yet a stylish suit among the rest for men’s to complement their modern lifestyle. It has a host of extraordinary features like it is waterproof, anti-stain, stretchable, UV-protected, wrinkle-free, breathable, and odour-repelling, and it’s constructed out of eco-safe materials. This flexible suit is packed with the best combination of sophisticated technology and environmental sustainability combined into a single two-piece that is perfectly suitable for all the occasions. The suit is designed by using some recycled plastic bottles and coffee grounds. The suit is a must-have for the men’s of today to complement with their modern lifestyle. 1) This is one of those eco-friendly dresses which is Anti-stain thus offering you the flexibility to eat or drink anything you like. 2) This flexible suit is rainproof as well as waterproof enabling you to step out even during a bad weather. 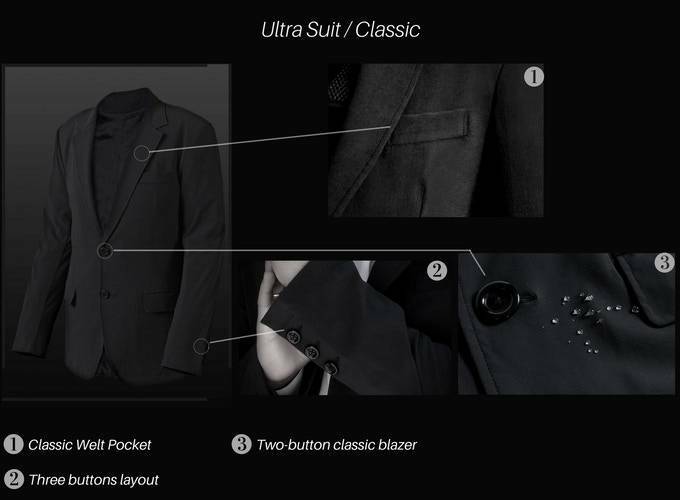 3) It is a 100% breathable suit that allows you to have full comfort while wearing it.